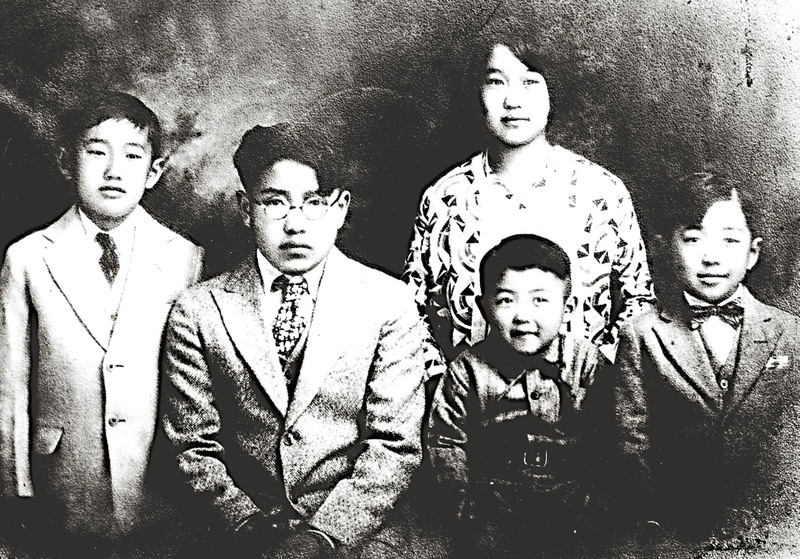 Pictured above, The Shiosaki children in 1930, left to right: Roy, George, Blanche (standing), Floyd, and Fred. At left, Blanche Shiosaki Okamoto, late 1930s. Photos courtesy of the Shiosaki Family. It’s a given. You don’t know your parents, no matter how deep your harmony and affection. There are, of course, the familiar tales of distances that separate American families by generations. Add to this the geographical distances that separate the backgrounds of Issei and Nisei generations (first and second generations) of the Japanese American families and then add the distance of the language barrier. One must also mix in the deep abysses between European and Asian cultures. The two generations were raised in two different cultures. Our immigrant parents are different from us in ways unknown to us because they assimilated into the life of the country of our birth, leaving the Nisei only bits and pieces of the lives they had left. 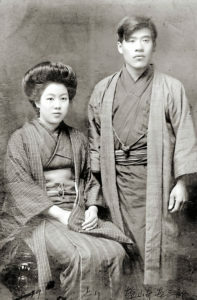 Tori and Kisaburo Shiosaki’s wedding photo, September 1915, in Japan. Photo courtesy of the Shiosaki Family Archives. What would urge a young couple to move to a far and distant land? A land where the customs are not only strange but in some instances completely different. A land where they did not speak the language. A land with hostility to those of a different color, and a special hostility at that time to those who were arriving from Asia. A land, in many instances, of harsh climates. But, it was a land where there was hope. Like many other Japanese immigrants, it was their hope that after a few years of hard work, they would be able to accumulate enough so that they could return to Japan with enough means so that they could find a comfortable living. The thought did not occur to them that with their children growing up in this land, that soon the children would be their future, and would make it impossible to leave. The Russo-Japan war (1904-1905) sent many young men out of the country. If the parents could afford it, they paid the fares to Hawaii and California. The Japanese inheritance system gave all the land to the eldest son. The other sons had to find other ways to work and survive. The military also exempted the eldest son. But, there were the trading companies, the Japanese version of coyotes. They had recruiters looking around the farming communities of Japan seeking healthy, strong young bodies who would be able to do the hard labor of the railroads being built in the Western states and the farm labor of the Hawaiian plantations and California ranches. These recruiters were paid by the companies that hired their services, and they also collected fees and/or promissory notes from the young men they recruited. America was a very popular place to go. 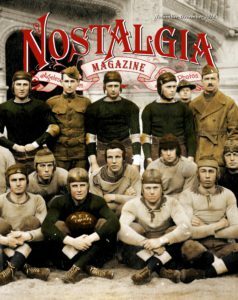 Nostalgia Magazine is first and foremost a print publication, delivered by a living, breathing letter carrier every two months. Don’t you prefer to read on printed paper, just like the good ol’ days? Well, you still can. Please support the mission of Nostalgia Magazine by subscribing today. Subscribe online here, or call us directly to order at (509) 443-3678. You’ll be treated to ageless stories and ageless photos, like the story of the Shiosaki Family, and more. Subscribe today! Comparatively few Japanese women came to the United States during this period. In certain areas of Japan, where the poverty was unbearable, wives and children were sometimes able to accompany the breadwinner. At times they had to borrow on the family farm. Most Issei men worked and waited for ten years and more, and then had their families in Japan select a bride for them. These are the brides called picture brides and the Japanese term was shashinkeikon, which translates to picture wedding. I have often wondered why most of these marriages turned out fairly well. If the couple were within a Japanese community, they would have support from them. Also there was a feeling of shikataganai. In English this word meant, “us against the world”; a Japanese philosophy that also helped keep a couple together during difficult times. Papa and Mom both came from a small city called Kakegawa, which is in Shizuoka prefecture. Papa’s birthplace was a township called Tamari, and Mom’s home was a township called Hatsuma. Both homesteads are still held by the Shiosaki and Iwaii families as they have been for generations. Kakegawa is depicted in the famous Tokaido wood block prints series by the artist Hiroshige. It is number 27 in the series. I understand that the Tokaido (which was in Hiroshige’s time more or less a wide footpath) was located right by Papa’s home. I don’t know if this is true or not, and I’ve never tried to verify it. It makes such a good story, so why ruin it. Above left, Kisaburo Shiosaki, circa 1915. 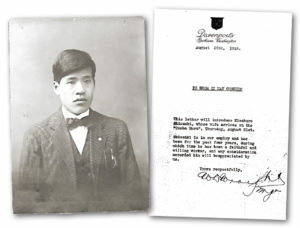 Above right, a letter from the Davenport Hotel verifying Kisaburo’s employment, which helped gain young Kisaburo clearance to re-enter the United States after voyaging back to Japan to marry. Photo and document courtesy of the Shiosaki Family Archives. Along with other young men from the Japanese countryside, Papa landed in Vancouver B.C. and was immediately put on a train headed inland. They were on the train for 24 hours before someone thought to feed them. They each had a piece of pie. Papa did not stay with the Canadian Pacific for too long. He sneaked over the border to Troy, Montana. (I have no idea how he knew where Troy was.) In Troy there was the Kuwahara family that was also from Papa’s home town of Tamari. 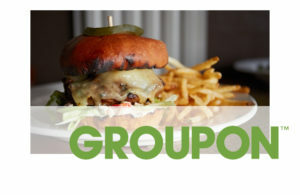 The Kuwahara’s had a restaurant there and fed the crews from the Great Northern Railroad. Mr. Kuwahara helped Papa get settled and find work. He did various kinds of work including that of a short order cook. He finally got a job as a bus boy at the Davenport Hotel. Now with a steady job, he saved money, got a job guarantee from the Hotel, bought a round trip ticket, and went back to Japan to look for a wife. Although his entry into the United States was illegal, by going back to Japan with a round trip ticket and guarantee of a job, he was able to clear his resident status. It was very clever, and I do not know of any other Issei that used this particular plan. He always used the second entry date as his official entry date into this country. In Japan, he met Mom and got married. Papa came back to America alone. It took him about another year of work to save up enough money to send for Mom. Meanwhile back in Japan, Mom was now living in Tamari with a father-in-law and mother–in-law, a brother-in-law (the eldest son) and his wife and their children. She was having a hard time. Brides in Japan get dumped on and this was especially so in past times. Work was hard and difficult. There were no servants (except Mom as she found out) and there was constant criticism from the mother-in-law, who knew that it was her duty to criticize a new daughter-in-law, and harped constantly. Mom describes that period of her life as misery with the only light a young Haruhei whom even as a young boy had a brilliant mind. The older sister-in-law did not get criticized. She had sons, which was an accomplishment and also because criticism didn’t bother her in the least. Finally in 1916, it was off to America. There were a number of picture brides on the ship. Mom was wearing a skirt and blouse as she got off the ship, but most of the women were wearing kimono and wearing their hair in that pompadour style. Papa was still working at the Davenport. They shared housing with another young Japanese couple to save money. Mom enrolled in English class until George was born in 1917. Then Papa went into business with two other men in this hand laundry in Hillyard. He moved his family to Wabash Street just off Market. There’s been an empty lot there for many years. Papa finally bought out his partners one at a time, and then moved his family to the apartment above the laundry. At that time, Papa and Mom had three children: George, Roy and Blanche. The laundry at that time was a hand laundry, except there were washing machines. A number of others worked there because everything was ironed by hand including the sheets. There was a big stove in the middle of the laundry with places to put heavy flat irons to be heated. When the iron got too cold, it was exchanged for a heated one. Those irons were heavy. Also the stove was dangerous for us little kids, and I’ve got the burns to prove it. 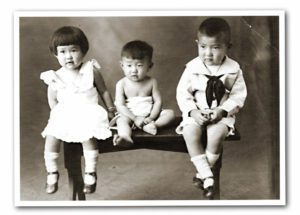 Blanche, Roy, and George pose for an early childhood photo in 1922. Photo courtesy of the Shiosaki Family Archives. The first machine Papa put in was an electric mangle. The sheets had to be folded in half to be put through this small mangle. Also the sheets had to go through the machine twice. Papa had a knack for machinery. I do not know if he had ever been instructed or had schooling in mechanics but he managed to add laundry equipment piece by piece and to understand its workings and keep things in good running order. This was an accomplishment since Papa had only a sixth grade education in Japan. Education in Japan was and still is mostly by rote. Where and how he learned to read newspapers is a puzzle, but he could read and comment on the news in the Spokane Daily Chronicle. Hillyard was, and sometimes still is, like a small town. People know each other, especially the tradespeople. The laundry, of course, made our family a little more visible than the other few Japanese in the town. Papa was known as “Kay” and Mom was called “Mrs. Kay.” If we ran into the harsher forms of racism it was rarely in Hillyard. The harshest form we children ran into was being called names by other children during the usual childhood squabbles. We knew the names of the grocer, the meat market owner, the hardware store across the street, the auto mechanic and others who had businesses up and down Market Street. There is no longer a Rialto theater. Saturday afternoon matinees at the Rialto were 5 cents if you were under 12 years of age. I remember seeing the Fu Manchu serial segments there. Now, that was stereotyping that was stereotyping. 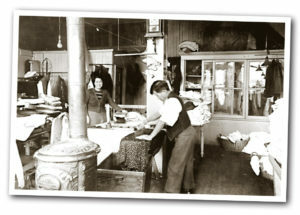 The Hillyard Laundry, owned and operated by Tori and Kisaburo Shiosaki. 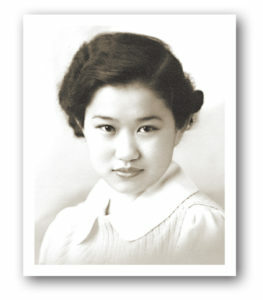 Photo courtesy of the Shiosaki Family Archives. The children all went to the Regal School and then to John R. Rogers High School. George, the oldest child, did his best to make things hard for the rest of us. He was well-behaved and got the best grades. Mom got after Roy and me to do as well. It wasn’t enough that the teachers kept holding up George as an example. Grrrr! I don’t know if Fred and Floyd got the same treatment. Perhaps to a lesser degree. Some of the teachers at the Regal School taught all five of us. Miss Owen, Miss Stevenson, Miss Palmer, and Miss Albo are ones I remember as having taught all of us. In high school, George was what is called a nerd today. He studied hard, did sciences and math and graduated as salutatorian. Blanche got interested in literature and writing. Roy graduated from four years of high school without ever having brought home a book to study. He still carried a better than B average. Fred made a lot of friends, was active in school affairs and ran the 400 in track. Floyd played baseball, was sports editor and editor-in-chief of the school newspaper. There was a Japanese community in Spokane, but we were not always active participants. We had to go to Japanese language school on Saturdays and during summer vacation. We took the street car from Hillyard through downtown up to Third Street. George and Roy quit this activity as soon as they learned to put their foot down, leaving Blanche to see to it that Fred and Floyd attended. Floyd has always complained that the teachers at Japanese school made him switch from writing left-handed to right-handed. Japanese language school was taught by well-meaning amateurs, who had no teaching training or skills. Since they didn’t know what they were doing, they were also quite arrogant about it. We did not attend the Japanese church, which was downtown, and instead sampled and visited the Protestant churches around Hillyard when we felt like it. I know I attended Sunday school at three different churches. 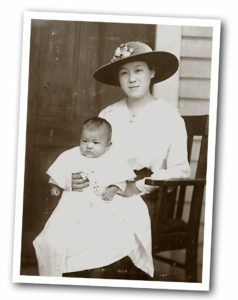 Tori Shiosaki with baby George, circa 1917. Photo courtesy of the Shiosaki Family Archives. The war years were difficult for all Japanese Americans in camp or not, citizens or enemy aliens. We were all perceived as the buck-toothed, slant-eyed enemy. The Chinese kid who worked in the restaurant in the next block had a sign on his jacket that read “Don’t shoot! I’m a Chinaman.” Even the friendly atmosphere of Hillyard seemed a little strained. Roy went into the army in early 1942, and Fred went to Gonzaga University for 1 year and then insisted on volunteering when the 442nd was being formed. Floyd was drafted into the army after Fred and Roy came home and served only two years and had a great time in occupied Japan. George had gone to college in Japan and went back in 1940 after a short visit home, and was stranded in Japan during the war years. While this was a difficult time for all of us, it was probably the hardest for George since he was alone in a foreign country, with no funds, no longer able to go to school, plus he had no passport to return. Spokane was not included in the evacuation process, and in spite of my parents worries, we did not have to endure that ugly experience. Actually they spent most of their time working, and if not working, worrying about their sons, especially after they were sent overseas. Wartime was a busy time in the laundry and I imagine every place else. We were not the only family worried. There were a number of Hillyard boys overseas and we knew them because they were friends of the children or the children of the neighborhood or children of laundry customers. We had an insignia hanging in the laundry window with two blue stars showing that we had two boys in the armed forces. We knew also that we were not the only tragic story of wartime. There was this father with two very young boys, about 6 and 7, whose wife had died. They had moved into this little apartment upstairs above the plumbing shop around the corner. The little boys had no place to play and frequently dropped in to talk to my parents. They were well-behaved children. Then they drafted the father because he was no longer married. He had to put his children into the orphanage and report for duty. When my brothers got home, around Christmas time 1945, Papa went to the bakery, ordered over a dozen cakes and distributed them in celebration. Then Floyd was drafted, but the war was over. After training, he spent time in occupied Japan, connected with George, met some of the relatives, played tourist, did some typing and came home discharged. Mom and Papa browbeat Fred into returning to Gonzaga. After a few years they started making plans for a return trip to Japan. In the meantime, they both became American citizens as soon as they were eligible. They could take the test in Japanese because of their age and longevity in this country. The interpreter said that Mom never waited for a translation of the question but started answering immediately in Japanese. She had studied hard for that examination and wanted to show it. Mom had funny English abilities. Although she had studied it, she never could speak it well. We teased her about her accent. 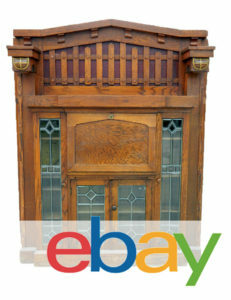 We thought the prize went to “pi-ru-de-ru-pi-yah” (Philadelphia), where Florence Itoh lived. Then there was this Sicilian lady who came into the laundry several times a year to have her curtains done. We hated to wait on her because we couldn’t understand a word she said. So Mom would have to. They would stand there at the counter, this Sicilian lady who didn’t speak English and this Japanese lady who didn’t speak English and talk to each other. How? Who knows? We would ask Mom what did they talk about, and she would say their children. 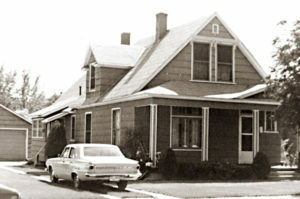 The Shiosaki home on Olympic Street in Northeast Spokane. Photo courtesy of the Shiosaki Family Archives. In 1964, Mom made a long anticipated return trip to Japan. This was a difficult trip for her. It exhausted her physically and after she returned she began to have heart problems. It turned out that the heart problems had been there from childhood when she had had a bout with rheumatic fever. Eventually she moved from the house on Olympic and into the housing especially made for the elderly Japanese. She died in 1977 at the age of 80. Papa was a quiet man. He was 13 years older than Mom. He had a lot of energy, was vigorous and hardy and couldn’t sit still. Funny, the way we associate little things with people. I will always associate the Russo-Japanese war song “Koko wa okuni no nanbakuri” with him. He sang it frequently while he was working. I don’t remember him singing any other song. Papa was very intelligent. I didn’t realize that he must have been very mechanically adept, to have been able to handle all the laundry machinery until much later. I just simply took it for granted. He must have learned by watching. The apprenticeship system in Japan is to watch. You don’t get instruction, you don’t ask questions. You watch and sweep the floor. Whatever you do, do it right or suffer corporal punishment—a knock on the head. You learn to watch. I really don’t know, but I imagine that is how he learned. About reading the Spokane Chronicle, I don’t know how he accomplished that. When I figure it out, I’ll let you know. Maybe it was a trick. Mom was also quite intelligent and a quick study. She really valued education. She was very “other-directed” and one of her favorite comments was “teisai ga warui,” which means it doesn’t look good. One of the few Issei ladies I knew who understood baseball. We had all frequently gone to the Spokane Indians games. She did not drive, and refused to learn after banging into someone’s running board while she was a learner. She was a very capable lady and made the best of situations. She was great to tease and would finally get mad at us and make a come back. So far as parents go, I think we were blessed. I knew Fred for several years he always referred to Lily as my bride. He is such nice person I was working down town at a bank but was transferring to a branch in the valley and he took me to lunch at the Crescent . I had seen Fred several times since but not in a long time I understand they moved to Seattle area.